Weighing in at more 200 kg and armed with sharp seven-inch canines, the ancient sabre-toothed cat is thought to have been a fearsome killer. But that deadly reputation could need revision: a study of the ancient animal’s skull shows it probably had a puny bite. 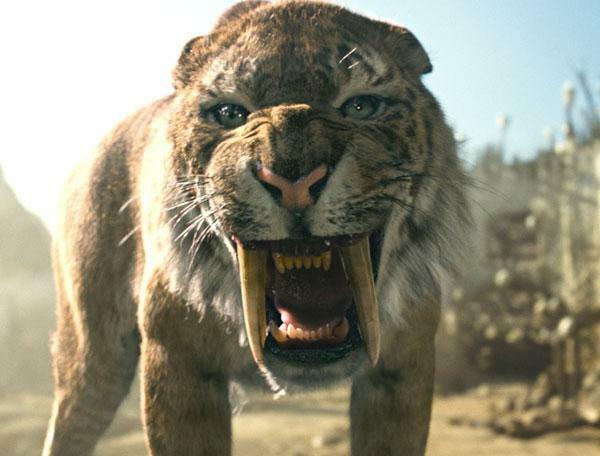 The sabre-toothed cat, smilodon fatalis, was the size of a modern –day lion but more powerful built. It became extinct 10.000 years ago. Ever since fossils were first described over 150 years ago, scientists have argued about how it might have used its fangs to kill its prey. By using computer modelling technique normally employed to measure the structural cars, strength of trains, planes and cars, scientist in Australia compared smilodon fossils with modern lion skulls. “Where the sabres used to take down large prey? Where prey killed an eviscerating bite to the abdomen? Was its bite powerful or weak compared with that of modern cats?” wrote Professor Stephen wroe, of the University of New South Wales in Australia, in the proceeding of the national academy of sciences. The computer simulations showed that ancient’s cats narrow jaw restricted its killing behaviour: the smilodons could bite only the strength of a modern lions. “For all its reputation, smilodon had a wimpy bite,” said wroe. But he said did not make the ancient cat a pushover. “Smilodon was an awesome beast – and what it lacked in bite force it more up for else ever”. The researchers speculated that smilodon’s relatively weak bite would have affected the way to hunt. “ the cat had an immensely powerful body; perfect for wrestling large prey to the ground, and our models show that it needed to do this before trying a bite,” said professor Colin Mchenry of the university of Newcastle in Australia. The smilodon was widespread across the plains of North America between 3 miles and 10,000 years ago. It is thought to have hunted to animals larger than itself such as horses and buffalo. It became extinct as a result of the environmental hanges after the last ice age. sabertoth cat are quite dangerous. i suppose. If you do have some more informations. do share with us. Hey, I love to collect information on pre historic creatures. You have a handsome material and i loved to read it. If u ever get more information on the creature, plz do share this with us…..